Topics: South-eastern Coast, Great Ocean Road, Northern Australia, and North-eastern Coast. On average 1.10 pages are viewed each, by the estimated 49 daily visitors. Webnx California is the location of the LiteSpeed server. 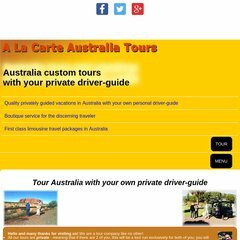 A-la-carte-australia-tours.com's IP address is 173.231.40.154. There are 4 DNS records, such as ns4.name.com, ns1.name.com, and ns2.name.com. PING www. (173.231.40.154) 56(84) bytes of data.